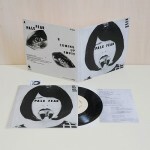 His Clancyness: Pale Fear b/w Coming Up Empty 7"
"Pale Fear / Coming Up Empty" is His Clancyness’ first release in three years and follows "Vicious", their debut album on England’s seminal FatCat Records. The record saw the band blaze a relentless trail across Europe and the US, hitting well over 150 cities across multiple tours. Whilst the band began life as the solo project of singer/guitarist Jonathan Clancy, it has since found a new form. Inspired by the camaraderie of life on tour, the group has evolved into a tour-hardened collaborative minimal noise-pop machine that features Jacopo Beta’s propulsive rhythmic drumming, Giulia Mazza’s alien synthesizers and Nico Pasquini’s axe wielding low thump. The last two years have seen the band retire to their Bologna basement headquarters, Strange City Studios. It was here that they conducted late night 4-track experiments, curious sonic investigations, the odd party and emerged triumphantly with countless inspired compositions that included a couple of new songs that are to be on their first 7” release for Maple Death Records. Recorded in Bristol at Portishead’s Invada Studios by Stu Matthews (Beak, Anika, Portishead), "Pale Fear’s" cassette-recorded beat rumbles through neon-lit streets of analogue synth noise and sleazy fuzz guitar and is steered with a pulsating, unshakeable Red Crayola-style bass line. All that grime and murk can’t obscure the pop sensibility shining through, however. His Clancyness stand firm with one foot in Plastic Ono/Bowie land and the other in Swell Maps/Faust country and they have a psychedelic post-punk gem to prove it. "Coming Up Empty", also recorded by Matthews, is curveball rock. Approaching like an inconsolably sad desert-torch tune, it then snakes through a claustrophobic sci-fi sequence born from Scott Walker’s nightmares over a dubbed-out Dario Argento-style motif before returning to its slow heartbroken beginning. It’s a strange journey, but this is a song from a strange city after all. It wouldn’t be right any other way. This release is a double A side. Let’s get the facts straight. "Pale Fear / Coming Up Empty" 7” single is housed in a fold-over 170gram jacket, designed by the band’s very own Giulia Mazza. Each copy is hand numbered and comes with download code and lyrics sheet. Recorded at Invada Studios in Bristol by Stu Matthews and mastered in Montreal by Harris Newman at Grey Market Mastering.